Watch what you're rollin' in out there! 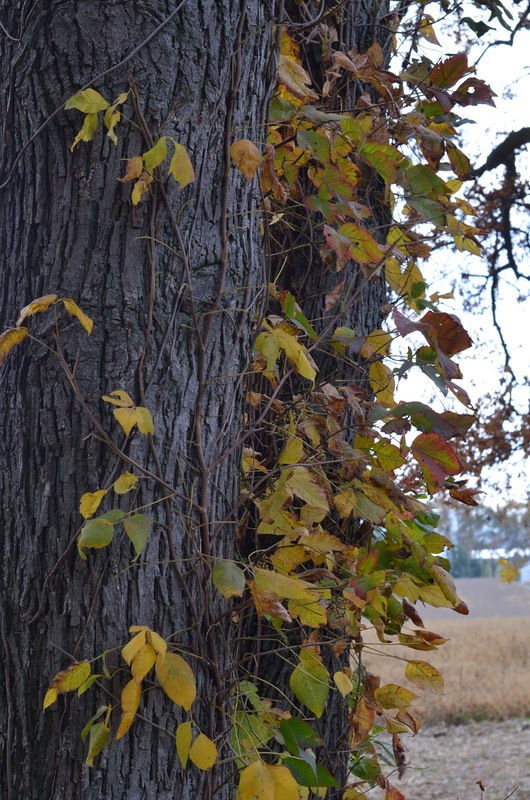 Because many people don't realize that you can abso-toot-ley get poison ivy rash in the fall, I figured I'd do a quick follow up on Poison Ivy and Pokeweed- Double Trouble to help others note the vine's sneaky change in appearance. 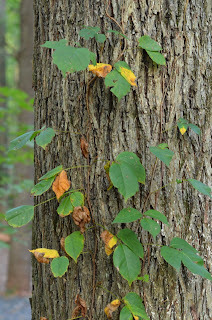 Here, this September poison ivy was just beginning to change from green to yellow. Isn't fall foliage breathtaking? Totes! But plenty of people out there don't realize that the dang poison ivy is just as purdy in mix. It's changing to blend in with the stunningly bright leaves that surround it. Those vines are turning awfully lovely to look at, but...let's not go rolling in these leaves, huh? 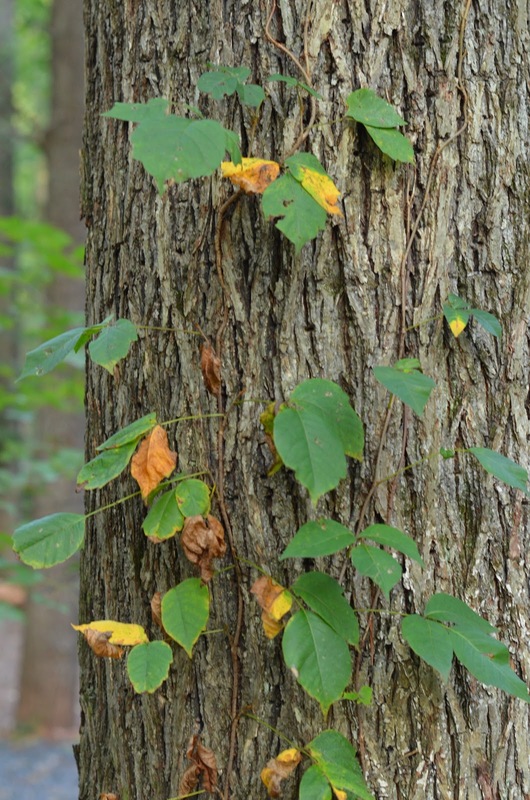 Right now, in late October, we're noticing the poison ivy leaves are changing from their September greenish/yellow to a light orange/red hue. So use a bit of caution when you're leaning up against that there tree to watch your kids romp through the ole' pumpkin patch. You might think you've got a great background for a photo op there, but if those golden leaves are rubbin' up against you...might not make for a camera ready face in a few days. Obviously, use extra caution if you tend to rake your fallen leaves towards the woods. It would be pretty wackadoo to go diving in a leaf pile that has a gorgeous poison ivy base at the bottom. Though, again, the photos following that day's doofusness would be entertaining for a lifetime. The experience of said doofus? Probably not so joyful. Look high and low for poison this season. It also makes a stunningly beautiful ground cover. Watch out! 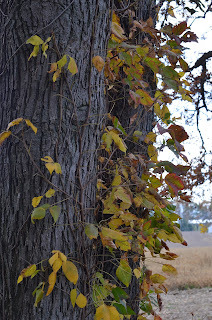 It's also the prime time to notice the berries these poison ivy plants produce. Birds love to eat these fruits, and they'll (ehem) drop the undigested remnants all over the place, helping to spread the seeds that will grow next season. 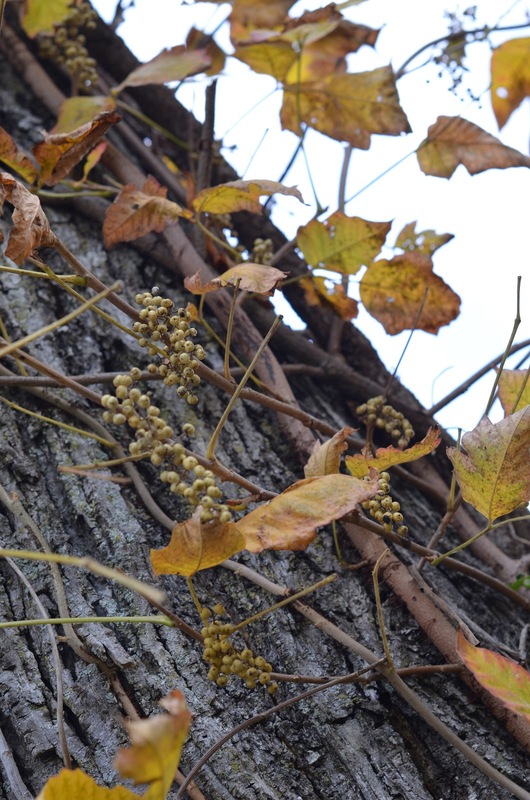 Being able to spot these berries will help you positively identify the plant in the fall. Notice the tiny berries on this late October poison ivy vine. Ugh. Isn't it just so typical that something this alluring and beautiful can cause such trouble? As always, your best defense is to be educated. In the words of the late Biggie Smalls (yup- I'm going there...), "If you don't know, now ya know." So enjoy scarlet backdrops, not flesh, this autumn and watch where you're walking.